The little-known lands in the far east of Middle-earth, beyond the great Sea of Rhûn, from where many attacks on Gondor and its allies came during the Third Age. Even Gandalf had never explored there, and though Aragorn had travelled there, we have no report of his doings. 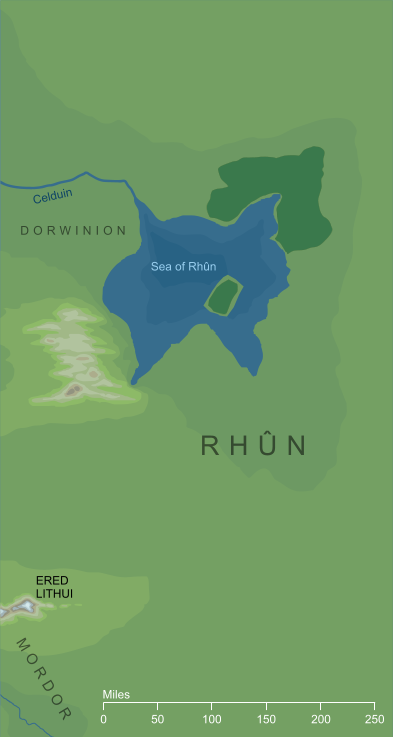 Of its ancient geography we can glean a little from the Silmarillion; far beyond the Sea of Rhûn was another inland sea, the Sea of Helcar, and beyond that a range of red mountains known as the Orocarni. Somewhere in the lost east, too, lay Cuiviénen and Hildórien, where Elves and Men first awoke: all the Children of Ilúvatar could trace their ancestries back to the eastward regions of Middle-earth. Rhûn was far from an empty land; it was the domain of the Easterlings, Men of Darkness who were ready to follow both the Dark Lords and fought as their allies in war. These lands, too, were peopled by lost Elves, Avari and Úmanyar, and by four of the seven clans of the Dwarves. During the Third Age, Rhûn was visited by three Wizards; Saruman, Alatar and Pallando, and though Saruman returned into the west, the two Blue Wizards remained. Sauron himself journeyed into the eastward lands, in hiding from the White Council during the centuries known in the west as the Watchful Peace. Original content © copyright Mark Fisher 1998, 2000, 2010. All rights reserved. For conditions of reuse, see the Site FAQ.